When in the market for a tablet there are many things that you will have to consider. Functionality is a big factor first of all. What will you be doing with your tablet? What features will you need or like to have? What size do you think you will need as far as screen size? What type of operating system will you be needing or prefer? And a very important factor that can ultimately make your final decision is how much do you want to pay for this tablet? With so many factors to consider you will want to sit down and really think about what your answers to these important questions are. If you don’t need a whole bunch of bells and whistles and you need the tablet for basic functions or for a child then you will have many more options to work with. If you are looking to save some serious money but also have a pretty functional tablet then you should definitely give the Chromo Inc. 7″ touch screen tablet a look. 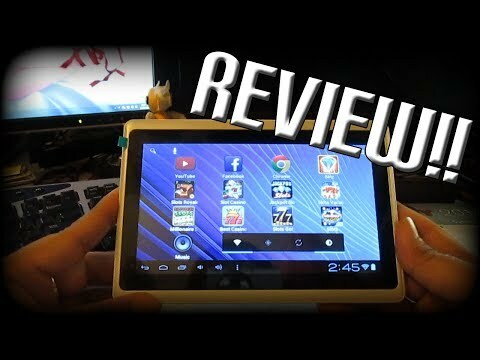 This Android tablet has plenty of features and best of all comes at a wonderfully low price. Touching back on the subject of purchasing a tablet for children, this particular tablet is an excellent choice if you want to buy one for your kids to play games on, watch videos, or interact with educational programs. The tablet is the perfect size for small hands but has a large enough seven-inch screen with 1024×600 resolution, so that they won’t have to strain to see what is on the screen. The tablet also comes with popular apps preloaded to the device such as Netflix, Google Chrome, Skype, and Google Play. The Chromo tablet includes 4GB of internal memory which is expandable up to 32GB if you use a micro SD card. A capacative touch screen for ease of use. It runs on the Android 4.4 Jelly Bean operating system and has 512MB of RAM. Some of the great features of the tablet are a front facing camera for Skype and selfie photographs, WIFI (with an Internet Service Provider), sound and voice recording capability. The Chromo tablet also meets TUV quality and safety standards. The average battery life of this product is around four hours. The tablet weighs 15.2 ounces and also has one USB port. The webcam resolution is 8MP. I was quite surprised how much I liked the look, feel, and durability of the tablet. If you are on a budget or don’t want to spend a lot of money for a neat little tablet for your kids to use, then this is an option that you will want to explore. This Chromo tablet has just enough features to please most people and has a great looking design and feel. While experts might scoff at this simple machine, most customers will agree that this is really a great buy for the money. Parents overwhelmingly agree that this is really a great buy for a child or a teen as it has all of the features that they could need. There’s plenty of space to store information and download content. If the Amazon Fire tablets aren’t to your taste, the Chromo Inc 7 Tablet is a flawed, but valid alternative.